Dr. Fujii graduated from Kauai High school then went on to the University of Hawaii where he received a BA in psychology. Dr. Fujii then entered Pacific University's school of Optometry in Oregon. He graduated with a doctorate of optometry in 1995 and has been in private practice since 1997. When not working Dr. Fujii's time is dedicated to his 3 sons sporting events and coaching their teams. Dr. Abe graduated from Iolani high school. He then went on to Pacific University college of Optometry in Oregon. Dr. Abe has been in practice for over 20 years. 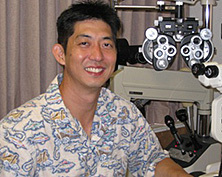 He is a past President of the Hawaii Optometric Association. In his free time Dr. Abe is an avid sports fan, he loves to watch all types of sports. He also likes to listen to music and loves to travel.